Hydraulic Reservoir Tanks "Field Performance"
Today's hydraulic systems are smaller but more powerful, the demands of oil cleanliness have become much higher. Clean, contaminant-free oil within the hydraulic system is the main ingredient in reducing potentially large warranty costs and extending the service life of components. Within a hydraulic system, contamination breeds contamination. Once contamination has begun seals are broken down over time, gaps grow larger and larger, leaks increase in size and metal-to-metal contact increases, this leads to operating inefficiencies and finally in time costly hydraulic component failure. The hydraulic tank/reservoir has been identified as a prime area of concern for OEM’s tackling this growing phenomenon. Many have gone down the correct route of ensuring their tanks are supplied by their tank manufacturer to the ISO 16232 standard of internal cleanliness. This for sure now gives piece of mind that the tank at that moment in time complies to a high cleanliness standard however over time and in machine operation do you know how your tank performs? Could it be the cause of hydraulic issues over the duration of your machines life? Many competitors of ours use a HR steel base material. Those familiar with this product will be aware that this is a scaled material. Most commonly tanks are fabricated with this material and then before painting the tanks will be externally shot/grit blasted to ensure the outer tank scale has been removed and the surface is prepared and ready for painting. Tanks are then internally treated and approved to ISO 16232 and supplied to the customer. What has failed to be recognised in this process is that the internal walls of the tank have most probably remained scaled. The ISO 16232 standard has been achieved as the circulated oil used to monitor cleanliness has failed to remove this stubborn wall scale at this moment in time meaning circulated oil is clean. I liken it to drinking from a glass that has hardened dirt stuck to the inside, when filled with water and drank that water is clean or close to it, leave that liquid in situ for some time or even begin to slosh it about (as a machine would in operation) then most likely that dirt will become dislodged to some extent contaminating your water, the same is a likely outcome for your tank in operation as this scale becomes dislodged either fully or partially. At Keltech we follow a focused strategy, we class ourselves as experts in our chosen areas, tanks of course being one of these. Owing to this ethos we take a much longer term view of our product. Sure we are delighted to supply an ISO 16232 standard tank to our customer but for us the true value is to supply a component that not only performs to standard at machine inception but goes on to perform throughout the duration of that machines life, that for us constitutes true customer value. Keltech working in partnership with our steel supplier Sebden Steel have sourced an alternative HROP un-scaled base material. This has all the same attributes as its cousin HR but importantly it has been treated before delivery meaning the all surfaces are clean. Tanks are fabricated, painted and then internally cleaned before full furniture fit out at Keltech. The customer now has a plug and play tank that can be fitted directly to their machine at final assembly, the tank at that moment in time meets the required ISO 16232 but more importantly in our opinion can maintain a superior level of internal cleanliness for the long term as all internal walls are scale free. This month Seamus Lawlor, Keltech Business Development Manager discusses his experience of the Enterprise Ireland International Selling Programme which he completed in 2013. This month Declan Cheasty "Keltech Warehouse Manager" discusses stock accuracy. 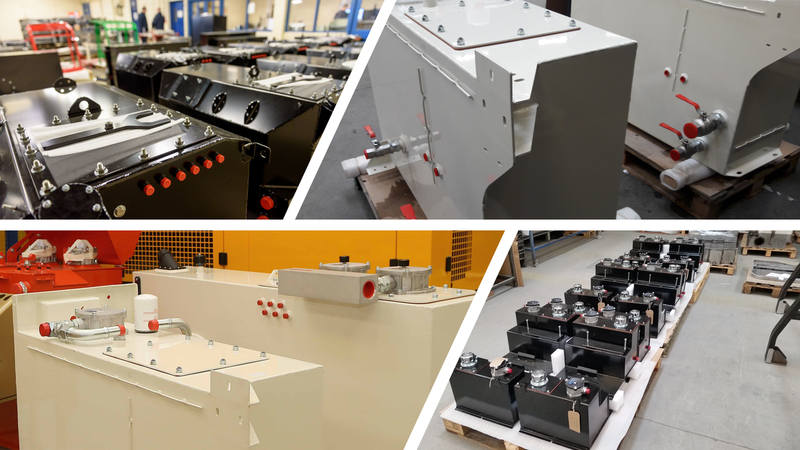 Keltech is a Contract Manufacturing partner specialising in the supply of integrated metal assemblies with a focused level of expertise in: Acoustic Enclosures, Reservoir Tanks and Cabins/Over-Head Guards. Keltech supplies OEM’s based in Ireland, the UK, Europe & the USA. Born in beautiful Tuscany in a city called Carrara made famous by its natural resource of white marble, Gabriele Fangano today finds himself happily living and working in Waterford City. Anxious for a new challenge Gabriele a qualified quantity surveyor and his fiancé Simona took the decision in early 2017 to move to Ireland. Up to this point Gabriele had been working in his father’s marble and natural stone business but in his own words “the travel bug took hold”. Keltech were delighted to welcome Julie Sinnamon; Enterprise Ireland CEO to our factory recently. The visit was an opportunity to reflect on the recent successes of the company and also discuss our exciting plans for the future. Keltech based in Waterford, Ireland is a contract manufacturing partner supplying blue chip OEM customers throughout Europe and North America. Keltech adheres to a focused operating strategy in 4 main business divisions, namely: Reservoir Tanks, Acoustic Enclosures, Over Head Guards & Cabins and Complex Fabrications. This focused approach has fostered a culture of recognised excellence in our chosen streams.